The Nissan Leaf, Chevy Volt, and Tesla Model S use different batteries, and different battery packs. But how are they constructed, and why are they constructed as they are? First, let’s start with the shape. The shape of a Leaf pack is not flat, but it hides under the seats and under the floor. The Leaf has a flatter rear floor, as Nissan puts more of the battery under the seat. The Volt has a T-shaped battery pack. Its rear floor has a hump to accommodate the long narrow pack. The top of the T fits under the back seat. Tesla created a flat battery pack that sits underneath the floor. Tesla calls that pack a skateboard. So, why are they shaped that way? Well, first we have to discover what’s inside. The battery cells that make up battery packs are of three types: cylindrical, prismatic, or pouch. A cylindrical cell is as familiar as batteries in a flashlight. Tesla uses small cells called 18650 cells, named after their dimensions in mm — 18 mm x 65 mm. It’s a fairly small cell. Then there are prismatic cells. They are larger and heavier, like auto ignition batteries, but a bit lighter because they don’t use lead. Next, there are pouch cells. Pouch cells are just a sheet of cathode and anode with a separator in between, and a thin covering, not much thicker than a piece of cardboard. Some pouches are about 8.5 x 11 inches and not very thick, and have to be enclosed by a metal package. All of those cell types start as thin layers of cathode and anode with a separator — like stacks of paper. The difference is that a pouch cell may be only one or a few stacks high. A cylindrical cell rolls the layers into a cylinder. And a prismatic cell folds a stack of these to fit inside a rectangular package. The pouch cell really doesn’t have a case, so one must be provided externally. All lithium expands when charged/discharged and heated. Even prismatics must have mechanical pressure to retain their shape. You can find pictures of bulged prismatics (see the image on right). Cylindrical cells use a metal case. That prevents the contents from expanding. A prismatic case is plastic and does not limit expansion. Because prismatics can swell, some mechanical pressure must be applied to keep their shape. With pouches, you also have to add the packaging externally to prevent swelling and protect the cell. Since each pouch is rectangular like a piece of paper, that sets their shape. In the Tesla pack, the cylindrical cells are arranged vertically. You can see the ends of them in the pack picture below. Their length comprises most of the pack thickness. They can be packed in pretty well, but space is allowed for cooling channels. The pack is flat and fits underneath most of the car. It’s thin enough that it’s hard to notice. The Leaf and Volt both use pouch cells. The Volt pack has arranged rows of pouch cells vertically and like a file cabinet. That makes the pack long and rectangular, but they made it in two sections that form a T shape. All the cells are vertical. The pack sticks up between the seats. The Leaf has its pouch cells oriented horizontally, stacked like paper in your mailbox. Under the seats, they are stacked higher than under the floor. The pack conforms to the space underneath unobtrusively. That’s the reason the Volt has a rear floor center hump. 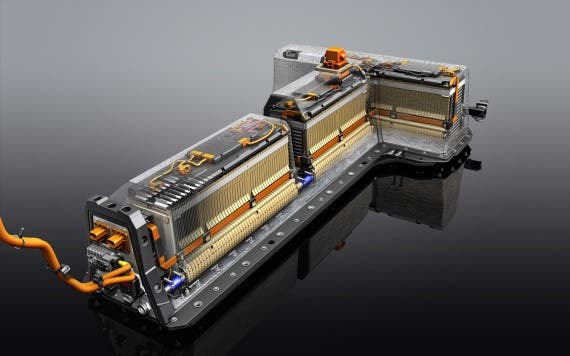 The T shape battery concept is one GM created for the EV-1. Nissan put the boxes under the seats and under the car. The pouch boxes are flat enough to put in a skateboard, but they don’t pack as well into the tight corners as the smaller cylindrical cells. There really could be a skateboard pack with pouch style cells. The cells are arranged in series to achieve about 400 volts. This voltage is chosen because it is high enough to allow smaller motors with less copper that have enough horsepower and torque for a car, and so the resistance losses are low. Lithium cells are about 3.6 to 4.0V, so a stack of about 100 of these cells in series is necessary to achieve 400 volts. There are other advantages that go with Tesla’s cylindrical cell approach. They can have many cells in parallel and any one cell can fail, but the pack will still work. Both GM Volt and Nissan Leaf are series cell arrangements. Just as in Christmas lights, if any cell fails, the whole pack fails. The downside to so many cells is that it’s harder to guarantee they all work. The downside to fewer cells is that they must all work. Now that I just analyzed the Leaf pack, we can compare. The new 2016 Volt pack is 192 cells, and this must also be series parallel, with 96 series. Since the pack is 18.4 kWh, we can tell approximate cell voltage, and capacity. Lithium cells are about 3.8V, so the pack voltage is about 365V. The pack amp-hr rating is twice the cell rating, because the cells are parallel. The pack amp-hr rating is: 18.4 kWh = 50.4 A-hr. The cell Amp hour rating is half of that, 25.2 A-hr. It’s a bit less than the Leaf rating of 33.1 A-hr per cell. The original Volt pack weighed about 400 pounds. The cells are also pouch type, not prismatic. Overall, they have quite a few similarities with the Leaf. They must be parallel series, two at a time. 192 cells would give way more than the pack voltage of about 360V. Two in parallel gives 66.2 A-hr x 365V = 24.16 kWh. They are side connected. The larger 4-pack is bulkier and packaging is more difficult. You can see the advantages of smaller cylindrical cells. Cooling and packaging are both better. Also, pouch cells must be enclosed by an outside mechanical package to limit swelling and to form them properly. Cells expand and contract with heat and charging, if not limited mechanically. Cells are kind of spongy that way. Oddly, the automotive knock on small-form-factor cylindrical is packing density. But Tesla has it right. You don’t want overheated EV batteries. Space is needed for cooling. All three battery packs have strengths and weaknesses. The Leaf pack uses all available area under the seats and floor, but does not have cooling. The Volt pack is well protected from intrusion with its T shape, but reduces interior floor space. The Volt pack is cooled. The Tesla pack provides a large amount of cell volume and provides for maximum interior space, but is more vulnerable to intrusion underneath the car. It also provides cooling. The choice between pouch and cylindrical cells is still a matter in progress, with some experts expecting pouch cells to emerge as the cheapest long term. Addendum: Since this article was written, news reports have surfaced that Volkswagen is moving toward flat batteries. No word yet on whether this means pouch cells, or a flatter battery pack. Volkswagen’s e-Golf has a battery pack with a center hump, but also uses the space under the seats and floor. The e-Golf differs in that it uses prismatic cells.